. : The bugs are back! The biggest reason we started the "Help Zach see the World" project was because the bugs were gone for the winter. Okay, well, MOST of the bugs were gone for the winter. 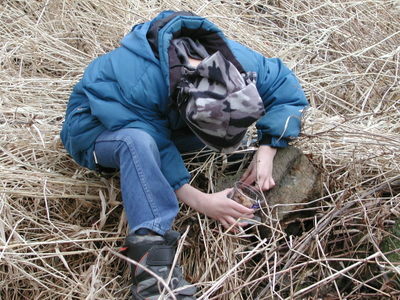 Zach has a way of finding bugs no matter what season it is, it seems. 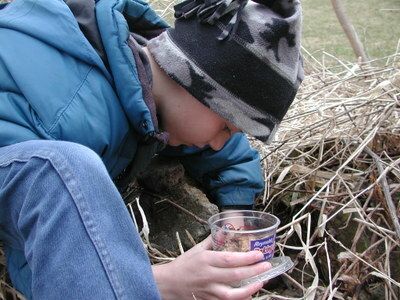 We really thought this whole winter would go by and there would be NO bugs in sight whatsoever, but that kid has a knack for entomology. Every now and then, he would come home with something in his bug jar. Those little bugs were most likely woken up from their hibernation, I'm sure. 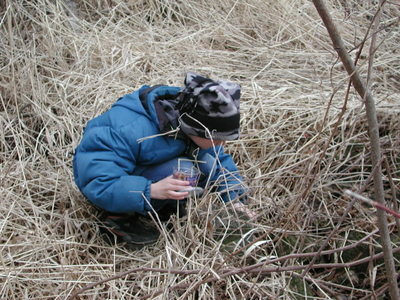 When Zach came home from school today, he went right into the brush at the edge of our property and started turning rocks over looking for "Roley Poleys." I'm sure this isn't their technical name, but it's what he and the kids at school call these bugs. He had a little bug jar with him...this bug jar was actually an empty plastic muffin cup container. You know the kinds that the paper muffin cups come in? He LOVES those...he's always asking for me to make banana chocolate chip muffins so that he can use the empty container for his bugs. So..........as he was turning over the rocks, it would turn up a BUNCH of these little bugs. He put some grass in his bug jar and pretty much scraped the bugs off the rocks and into his bug jar. He must have had about 30 in there! Zach brought his bug jar in after he'd caught his fill and then sat at the table with it. He opened the container up so that he could see them better. He sat there singing and talking to them in the special "language" he's made up for the bugs he catches. He knows the names of these bugs, but he has his own special names for them, and special sounds that he says these bugs make. Often times, he tells us to repeat what he's said. For instance, pill bugs are "doo-doo-doo bugs". Gypsy moths are "tev moths." He knows they're pill bugs and gypsy moths, but these are the names he says they give him. He finds it so incredibly funny when we repeat back the things he asks us to repeat. He has such a wicked sense of humor. We're all glad the bugs are back. We've all been waiting for this ALL winter long. Zach was so desperate for bugs that he even took to searching through our potted plants for aphids, and if you know anything about aphids, they're SMALL! Tiny! Miniscule! We've had dirt on the floor around those pots on more occasions than I'd like to remember. Zach even has sister catching bugs now. Her favorite is the wooly bear. She comes home with a few each day and has a house for them...which they get out of on a frequent basis. It's probably good that she catches new ones each day. They replace the dead ones that we find in their bedroom. HA! And yes, I'm serious!